Although Texas' longest-serving governor was, perhaps unsurprisingly, pro-oil and gas during his tenure, he didn't simply nod to those iconic, staple fuels: “You can be proud that Texas produces more energy from wind turbines than all but five countries,” he said. Indeed, Perry left a nuanced energy legacy — including overseeing booms in fossil fuels and renewables — during his time in Austin. (Texas is now the No. 1 U.S. producer of both natural gas and wind energy.) Now, he is poised to take his experience to Washington, where President-elect Donald Trump has reportedly tapped him as U.S. secretary of energy. The appointment would mark a full repair in Perry’s relationship with Trump, whom he called “a cancer on conservatism” last year while the two men were in a crowded field for the Republican presidential nomination. If confirmed, Perry would become the third Texan to land that job, which involves overseeing energy research and policy with ramifications on the economy, environment and national security. And he would certainly bring different perspective and background to the role than his two predecessors — nuclear physicist Ernest Moniz and Physics Nobel laureate Steven Chu. Environmentalists and others question Perry's qualifications to lead the massive federal agency, particularly because he called for its elimination during his first unsuccessful presidential bid five years ago. While they concede that he championed renewables during his tenure, they also describe a more fervent support for traditional fossil fuels. "Judging by the past, he has backroom deals with special interests and big polluters — the rest of the economy and the air be damned," said Jim Marston, the Texas head of the Environmental Defense Fund, recalling a 2005 executive order to approve coal plants that his group successfully challenged in court. Last year, Perry joined the board of Energy Transfer Partners, the Dallas-based company behind the controversial Dakota Access Pipeline; its CEO, Dallas billionaire Kelcy Warren, was a major supporter of Perry’s political endeavors. But Perry's intimate understanding, and support, of the energy business makes him the perfect choice, said former Texas energy regulator Barry Smitherman, the only person to have served both on the Texas Railroad Commission and the state’s Public Utility Commission. "He's incredibly qualified. I mean, he was the CEO of our state during 14 years of incredible energy development," he said, recalling Perry's support of state energy regulators during the shale revolution and of new electric lines to deliver wind energy. "Gov. 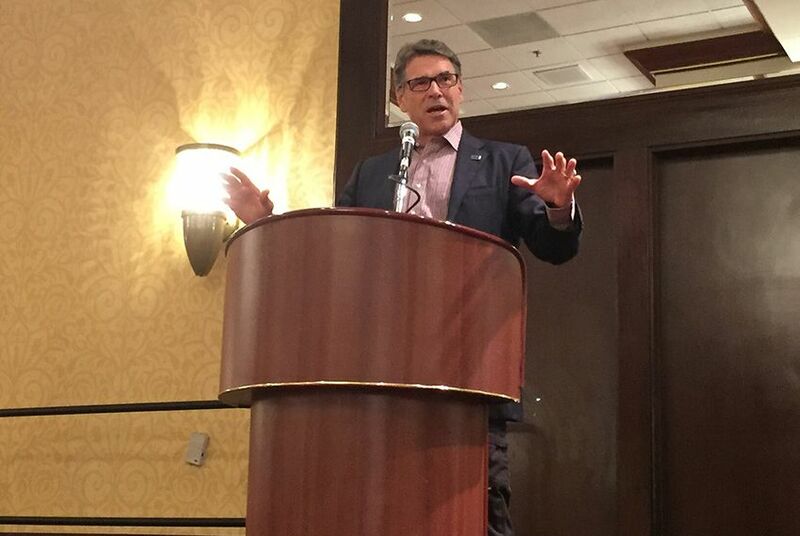 Perry has been at the epicenter of all these advances." Washington D.C.-based power utility lawyer Joseph Hall said he suspects "Perry will be well-received by the energy sector." "He’ll need to express his goals for the National Nuclear Security Administration [a semi-autonomous agency within the DOE], but Texas is a market leader on the policy, law and economics of the oil, gas and electric power industries," Hall said in a statement. "He understands carbon policy, the oil and gas business and generation and transmission development." Here’s a look back at Perry’s energy legacy in Texas. Perry also signed a bill in 2003 that made permanent a controversial tax break for “high cost” natural gas that has saved drillers billions of dollars over the years in avoided payments. Marston, of the Environmental Defense Fund, said much of the renewable expansion wasn't Perry's idea but that he also supported it. That was likely because of job growth, not global warming, noted Smitherman, the former Texas energy regulator. "For us, wind development in Texas was never about climate change — it was about economic development and diversifying our portfolio," he said, adding that it "is nicely diversified at the moment with natural gas, wind, coal and nuclear." As Texas governor, George W. Bush laid the groundwork for the state's rapid wind energy growth. He signed a bill in 1999 that ultimately deregulated the electric sector — a mammoth undertaking that Perry would oversee — and established a renewable-energy requirement that kick-started wind development. Perry added to that in 2005 by signing legislation that required Texas to increase its renewable energy capacity to 5,880 megawatts by 2015. The state shattered that goal before Perry left office. Perry also backed a $7 billion electrical transmission project to connect windy, largely empty West Texas to growing cities demanding more power. Completed in 2013, the Competitive Renewable Energy Zone initiative stretches nearly 3,600 miles and can send up to 18,500 megawatts of power — including from non-wind sources — across the state. Advocates were generally unhappy with Perry’s efforts on solar energy — or lack thereof. Because of its size and intense radiation, Texas leads the nation in solar energy potential, but the solar industry struggled to get a foothold during Perry’s tenure because lawmakers provided fewer incentives than other states. Though still just a fraction of the state’s energy portfolio, solar generation grown rapidly since Perry left, mostly due to improved technology that makes it cheaper. Perry forged ahead on new coal plants while governor, even as some states had stopped permitting new ones amid pollution concerns. In 2005, he issued an executive order to help rapidly approve coal plant permits. A power conglomerate planned to build 11 coal-plant units but ultimately scrapped plans for eight of the carbon-dioxide spewing units after environmentalists protested. "It would have been catastrophic for the climate," he said in an interview Tuesday, describing it as "literally a backroom deal to help political donors." Perry has also advocated for what supporters call “clean coal” — power plants that capture store and later sell those emissions to oilfield companies wanting to bolster productivity. He set up a clean-coal technology council in 2002 and signed a bill with tax incentives for clean-coal plants in 2009. Since then, several such projects have struggled to get off the ground. Meanwhile, coal power has steadily lost market share to natural gas and renewables in recent years — in Texas and across the United States. During Perry’s tenure, Texas became home to one of the nation’s few facilities that accept low-level nuclear waste. Since 2012, Waste Control Specialists in Andrews County, a company that was formally owned by the late Dallas billionaire and Republican donor Harold Simmons, has disposed of contaminated tools, building materials and protective clothing, among other items, from shuttered reactors and hospitals. Over the objection of environmental groups, that site rapidly grew during Perry’s final years in office and gained state permission in 2014 to double its capacity (if it wanted to) and reduce its financial liability should its owner suddenly close up shop. This year, Waste Control Specialists applied for a license from the Nuclear Regulatory Commission to store spent nuclear reactor fuel at its facility in West Texas — pitching it as a temporary solution to the problem of finding a final resting place for the highly radioactive waste. The U.S. Department of Energy plays a major role in advancing and implementing policy on nuclear waste. If Texas decided it would like to permanently store spent nuclear fuel, Congress would need to change the 1987 law naming Yucca Mountain as the nation’s repository for high-level radioactive waste. The U.S. House and Senate remain sharply divided on the issue. In 2014, Perry ordered the Texas Commission on Environmental Quality to evaluate the “challenges posed by spent nuclear fuel and other high-level radioactive waste” that is currently stored at reactor sites. Perry’s critics suggest that conflicts of interest could cloud his tenure as energy secretary. As governor, he accepted more than $14.3 million in campaign cash from energy and natural resource interests, according to the National Institute on Money and State Politics. To join Trump’s Cabinet, Perry must comply with laws seeking to prevent financial conflicts of interest. He would have to sell stock that might be seen as a conflict and potentially put those assets into a blind trust, said Larry Noble, general counsel for the Campaign Legal Center, a nonpartisan campaign-finance watchdog group. Perry must also step down from any board positions that could conflict with his duties. That would likely include breaking any ties with Dallas-based Energy Transfer Partners, which added him to its board of directors last year shortly after the end of his gubernatorial tenure. Led by CEO Kelcy Warren, a Texas Parks and Wildlife commissioner and major political donor who served as Perry's campaign finance chairman during his 2016 presidential campaign, the pipeline giant is building the controversial Dakota Access natural gas pipeline that Native American groups have vigorously opposed and is currently stalled. Perry and Warren have long been close — personally, politically and professionally. Vicki Granado, an Energy Transfer spokeswoman, did not return messages Tuesday. But the company’s website still listed Perry as a board member. Federal ethics statutes alone would not address critics’ broadest allegations of Perry’s coziness with industry executives, Noble said. It would be up to the U.S. Senate to evaluate those. The energy ties certainly don’t seem to bother Texas’ Republican leaders, including some who view them as assets. Praising Perry and Secretary of State nominee Rex Tillerson, Gov. Greg Abbott said Tuesday that both potential Cabinet members would be beneficial for Texas. “They obviously know Texas. They understand Texas ... especially the economic drivers of this state," Abbott said. "And so we would have as both the head of energy and the chief international diplomat, someone who — both of them would be in positions to drive and enhance the Texas economy." With President-elect Donald Trump set to tap former Perry to head the department of energy, here's a closer look at the energy legacy of the state's longest-serving governor. Disclosure: The Environmental Defense Fund has been a financial supporter of The Texas Tribune. A complete list of Tribune donors and sponsors can be viewed here.